I'm working with LibreOffice on my Ubuntu PC. It's quite good you know... and it's free. In formulas I found bug (a+b).It's doesn't display corectly.Sorry for my bad english. Where is the English option? Online installer updated with English. 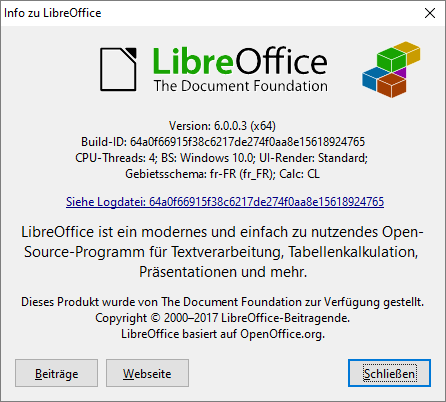 I used the installer to create a portable version of LibreOffice 4.0.5. However, it needs admin rights to run, unlike the "official" LO Portable from portableapps.com. Is there a possibility to make a portable Version of LO 4.0.5 (or 3.6.7) that runs without admin rights? Not tested (I have always admin rights) so let me know if it is good. Hi Bernat, is it possible to associate, by just a few clicks, the more commons Office file extensions to your Portable LibreOffice? It would be useful a tool (external or integrated in PAF package) which, when necessary, allows to specify the folder of LibreOffice Portable and the extensions to associate (default the most commons). The tool should allow to permanently change the associations of the operating system (XP and later) or the configuration of LibreOffice Portable (temporary). Thanks, bye. Same procedure to go back to associate to Word. Too much possibilities and too much time to spend to integrate in launcher or installer. Your latest downloader does not manage to properly extract the LibreOffice 4.1.4 files from the msi. It always fails on the way but log is so fast that I could not read it. It is maybe related to the fact that it is version 4.1.4.2 that is downloaded. Tested of course before posting. It seems it was related to the coporate antivirus from the company I work in (but strangely the msi accepts to start, thing that would not happen if the AV had modified it). With a direct Internet download I have the same MD5 and everything is fine. Sorry for the mess and encore une fois bonne année 2014 et plein de belles applis portable comme tu le fais si bien depuis un moment déjà. Maybe the problem is that I wanna install the "trasditional chinese" version? Tried with zh-TW on a french windows and got a 470 MB LibreOfficePortable folder with zh-TW resources but running in english for me (perhaps missing chinese fonts on my computer). Did you try with the simplest paths (without special character)? how can we remove the splash screen logo ? I downloaded the 4.1.4.2 version without problem but I can't open pdf documents with the Draw app.I tried twice. I portabilized the same libreoffice version with "Cameyo" and the Draw app is able to open pdf documents. I'd prefer use your portable suite. Any suggestion about this issue? It's a problem of mine? Online installer need to be fixed. Tested only with Java portable. First of all, thanks for being so fast releasing update. I've got one question about the launcher. For some reason, I can't open more than one document when double-clicking on it (LibeOffice association is configured via Total Commander associations only for full portability). Is there a specific parameter to change (AllowMultipleInstances is set to true) or can it be a bug ? You are right (error in Launcher.nsh for 64 bit). Tested working on Windows 10 x64 (previous launcher worked forcing 32 bit by renaming LibreOffice64 in App). Can you capture the error message? Using W10 x64 as well. I have no visible error message but I just replaced launcher to use it with 5.0.2 version. Maybe the cause of this issue. Otherwise, can you advise how I can log any useful information? Using Windows 10 x64 as well. Unfortunately I don't have any message. Initially thought that I had this issue because I was using 5.0.2. I updated to 5.0.3 and problem remains. How can I log interesting stuff? Don't need 32 bit installed for 64 bit second launch. Version 32bits was not installed as you guessed. 3rd fix works perfect. Thanks for the numerous updates today! I had a doubt last time but now I am sure, you did not add the latest fix for x64 version in your latest downloader. Working LibreOfficePortable.exe size is 61817 (MD5: 8928e057cfb36324221a72f2bbad52f9) and the one included size is 61809 (MD5: 424ca7783aa85bb327824e117a8a8b49). I hope you can fit it at some point. You are right. Installer updated. Thanks. Installer tested working on Windows 10 x64 1703. Your paf shows UNREAD words in Traditional Chinese OS in your PAF extractor, and then if sometimes you need a translator I would like to help you. I did any translation in installers. I use a old (2.46) ANSI NSIS version that show all unreadables characters in Arabic or Chinese on a French computer except when I compile in UNICODE (for Firefox). Therefore the language files used are readable and if there is something to correct, thanks to do this without changing encoding characters. Sorry, but too much time to spend to update 600 lines of script. hola, buenas noches, podrias subir la ultima version de este programa, la 6.1.3?